Project Description: The project consists of upgrading the roadway lighting at the interchange of I-97 at I-695 in Anne Arundel County, Maryland. This is a complex and congested interchange just east of the Francis Scott Key Bridge near Baltimore. T3 is responsible for preparing roadway lighting plans and erosion & sediment (E&S) control plans for the project. T3 conducted a field inventory for the existing lighting system to determine if the lighting system could be modified or if it needed to be totally replaced and tied into lighting systems at adjacent interchanges. After evaluating the existing lighting and sign structures, T3 developed lighting plans with proposed lighting cabinets and available power service locations. Lighting plans were designed to re-use existing light poles / cables wherever possible to decrease overall cost. T3 also developed E&S control plans and calculated the limits of disturbance (LOD). Project Description: Develop tourist area and corridor (TAC) signing plans for new or modified signs and removal signs in Montgomery County. TAC Signing is a system of supplemental guide signs which directs motorists to eligible individual attractions by first directing them to groups of attractions. Attractions are grouped into geographical area and sub-area. Each area or sub-area has a defined roadway corridor to provide access to the attractions within. T3 developed signing plans in accordance with current SHA standards to modify or replace existing signs to guide the traveling public to tourist destinations throughout Montgomery County. T3 conducted site visits for over 300 existing and proposed sign locations to examine and measure existing signs and sign supports, verify existing roadway geometry and site conditions, and obtain measurements and cross sections at each location. T3 then evaluated concept plans to ensure that all proposed signs met current Maryland SHA TAC sign guidelines and followed the Area-Corridor Guidance Hierarchy for attraction trailblazing and individual attractions. T3 completed signing plans for the project by separating the entire County into sub-areas to aggregate similar destinations. Milestone submissions involved Final Review and PS&E packages that both included quantity summaries and engineer’s costs estimates. Plans included a cover sheet, maps for each of the sub-areas, plan sheets with construction details, guide sign detail sheets, guide sign support charts, and quantity summary sheets. After the Final Review submission, T3 coordinated with SHA, the Montgomery County Department of Transportation and the Montgomery County Tourism Board to discuss specific locations. Signing plans were designed to comply with the latest MUTCD and TAC signing requirements. Sign supports were designed based on SHA standards for sign size, loading, post spacing, post vertical clearance, and roadside cross section at each location. Sign placement ensured each installation was within SHA or County right-of-way and with adequate lateral clearance. Most signs were installed on wood breakaway or non-breakaway supports, but oversize signs and steep locations required calculation of steel supports using Transpo sign support spreadsheets. All installations were designed to comply with sign spacing guidelines for advance warning signs, as well as minimum spacing between signs. All signs were designed using GuidSign software and the latest standards specifying Highway Gothic fonts. 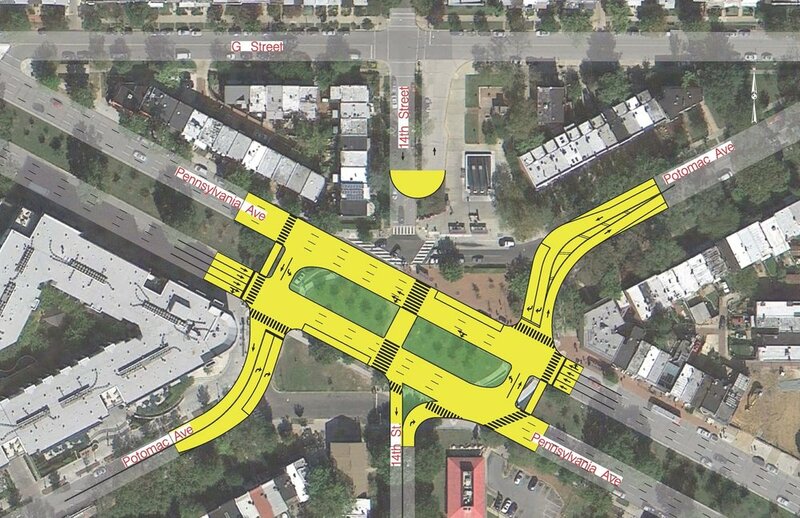 Description of Project: The South Capitol Street Corridor Project calls for replacing the Frederick Douglass Memorial Bridge and transforming related sections of urban freeway into a beautiful scenic boulevard that increases pedestrian and vehicular safety, improves multi-modal transportation options, increases community accessibility and supports economic development on both sides of the Anacostia River. T3D’s Role in Project: T3 prepared technical requirements for maintenance of traffic (MOT) for inclusion in the construction documents for the South Capitol Street Bridge Design/Build Project. MOT technical requirements included general requirements, mandatory standards, performance requirements, design requirements, construction requirements, and submittals. The requirements for the transportation management plan (TMP) work zone impacts management strategies, TMP monitoring, contingency plans, and TMP were based on operational performance. The design requirements included the traffic control plans, minimum lane width, allowable lane closures times, allowable ramp closures, and allowable pedestrian/bicycle trail closures. Liquidated damages sections were developed for delayed completion, lane/ramp closures, allowable lane/ramp closure times, and allowable pedestrian/bicycle trail closure times. In addition, T3D reviewed the 30% concept plans for MOT plan which included stage/ phase revisions, ramp sequencing to match traffic projections and maintain all critical movements through all stages/ phases. Both the South Capitol Street Bridge and the Theodore Roosevelt Bridge are major routes into downtown Washington, D.C., which require careful planning to ensure that the impacts to vehicles, pedestrians, and bicycles are mitigated during construction. Description of Project: The Maryland State Highway Administration (SHA), Office of Traffic and Safety (OOTS), Traffic Engineering Design Division (TEDD) has requested KCI Technologies, Inc. (KCI) and T3 Design (T3D) to prepare plans for formal advertisement to upgrade the existing roadway lighting at the interchange of US 29 at MD 32 and Rivers Edge Road in Howard County. Due to the complexity of the project, multiple redline revisions were required to complete the plan set. T3D’s Role in Project: T3 prepared interchange lighting base plans at a scale of 1” = 50’ and performed a field inventory to verify existing lighting features such as light pole and sign structure locations and numbers, manhole locations, lighting cabinet locations, and junction box locations on parapets/concrete barriers. T3 conducted a photometric analyses for the corridor in AGi32 to comply with SHA roadway lighting guidelines. T3 developed photometrics in point-by-point format along with the relevant statistics for each area including the uniformity ratio, veiling ratio, and minimum-maintained lighting level. All luminaires were designed to remove high pressure sodium fixtures and install new 280 Watt LED cobrahead luminaires. Once SHA approved the photometrics, T3 prepared lighting plans for Final Review and PS&E milestone submittals. 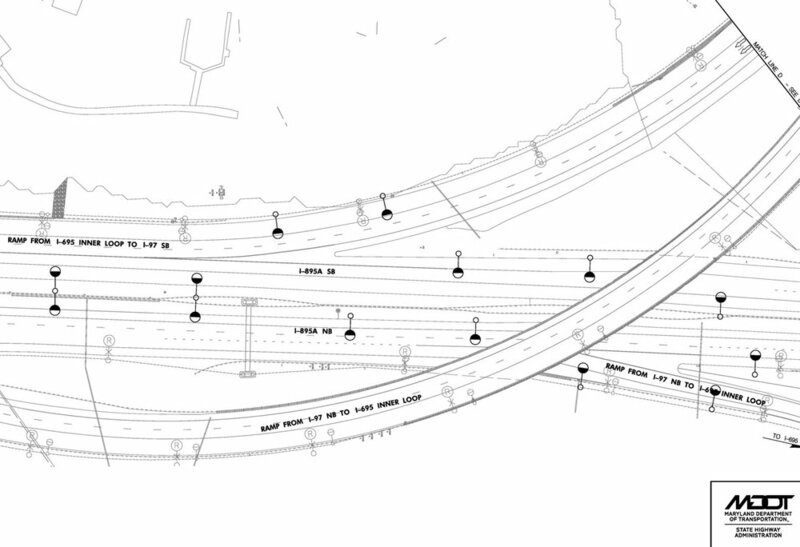 These plans included the location of all proposed lighting poles and underpass luminaires, manholes, and new control panels and existing light poles to remain or to be removed. The appropriate “tag” was shown for each pole indicating the location, size, circuit, and number of each type of connector kit. Electrical manholes also were shown with the connector kit tag, and T3 prepared a Schedules of Poles, Panels and Manholes. T3 also prepared voltage drop calculations, coordinated the new electrical services with SHA’s Traffic Engineering Design Division (TEDD), placed a service application request with Baltimore Gas & Electric, calculating limit of disturbance areas and cut and fill quantities which were shown on erosion and sediment control sheets. Project Description: Take recommendations from the STARS (Strategically Targeted Affordable Roadway Solutions) Program and prepare traffic signal modification plans to implement. The STARS program is intended to develop comprehensive, innovative transportation solutions to relieve congestion bottlenecks and solve critical traffic and safety challenges throughout Virginia. Prepare signal modification plan and pavement marking plan. The modifications involved a complete rebuild of traffic signal equipment at all three intersections, with signal poles and mast arms that met current VDOT standards, LED signal heads, along with installation of crosswalk and pedestrian improvements, signal timing and phasing changes. Plans were developed at 1”=25’ scale, with general notes, plan views, sign details sheets for all street name and advance street signs, and quantity summary sheets by intersection. prepared preliminary and final traffic signal plans and coordinated with the pavement marking plans to establish optimal locations for stop lines and crosswalks. T3 designed street name signs to meet new VDOT signing requirements and to be installed on mast arms. Preemption equipment and wiring was designed as an independent conduit system so that it could be maintained by Prince William County. Description of Project: Dupuy Avenue is a critical east-west corridor in the south-west quadrant of the City of Colonial Heights that serves as a primary route for residents of southern and eastern Chesterfield County to I-95 as well as a primary access route to and from Virginia State University which is expected to double its student population in the next 10 years. The growth of the population in the Tri-Cities region is also expected to continue as part of the BRAC activities at Fort Lee. The City wanted to develop and deliver a federal-aid transportation construction project to modernize a section of Dupuy Avenue, from Chesterfield Avenue to Western City Limit. Morris served as T3’s Project Manager and her responsibilities included creating sign panels in GuidSign, reviewing turn lane lengths and preliminary roadway layout, preparing sign inventory materials, checking the proposed signal equipment layout, establishing locations for pedestrian crossings, and determining the growth factor on Colonial Heights Boulevard for Dupuy Avenue. In addition, Morris managed development of pavement marking design plans, pavement marking quantities, right-of-way needs, new street signs for mast arm installations, and sign panels. T3D’s Role in Project: T3 prepared a traffic study report for the project, including traffic modeling and analysis. The study included data collection and processing, and review of the historical traffic volume data along the study roadway; the City of Richmond Regional Model for the traffic growth rate calculation; and, the Virginia State University Multipurpose Center Traffic Impact Study for the trips generated by this development at the study intersections. T3 staff prepared traffic volume projections for the build-out and design year conditions. She also supervised preparation of Synchro models to conduct capacity, queuing, and arterial analyses for the existing, build-out, and design year conditions and developed recommendations for traffic signalization improvements, including coordination, phasing and timing for the existing traffic in the corridor for the opening and design years. T3 managed development of a TMP for managing construction-year traffic that includes not only the work zone within the project limits but also an area-wide assessment of the impacts of project construction to surrounding roadways, pedestrians, public facilities, emergency services, residents andbusinesses The TMP elements included traffic control strategies, public communication strategies and transportation operations strategies. T3 completed pavement marking and signing plans for the project, separated into four milestones: 30 percent, 60 percent, 90 percent, and 100 percent plans. This work entailed completing an existing sign inventory along the corridor to catalog details on each existing sign, including panel message, sign size and offset from road, sign structure support type and size, and sign condition rating to assess retroreflectivity, fading, damage, and compliance with the latest MUTCD sign standards. T3 prepared pavement marking plans using the appropriate materials based on the roadway traffic volumes and designed crosswalks with treatments to enhance visibility in high-pedestrian areas, such as near a college. The proposed design included a two-way left-turn lane throughout the segment. Signing plans were designed to replace signs impacted by the roadway project and to upgrade any existing signs that would no longer comply with the latest MUTCD signing requirements, along with additional signing required to accompany the two-way left-turn lane. Sign supports were designed based on VDOT standards for sign size, loading, and roadside cross section at each location, and sign placement ensured each installation was within City right-of-way. T3 completed quantity summaries for pay items to comply with local preferences for each milestone delivery, along with an engineer’s cost estimate based on recent construction bids for items on similarly-sized projects in the area. T3 also included insertable Interim Standard sheets in the planset for any applicable standards that had been revised since the previous VDOT Road and Bridge Standards were published. T3 also developed standards and specifications for non-standard items, where required.